As in modern times and other times in history, during the 18th century, many styles of jewelry and accessories were seen. In the colonies, jewelry was obtained from local goldsmiths and silversmiths as well as from England. Styles and tastes could vary from one city to another. This was a time period of large garments for formal wear and as the century was in the last quarter, large and tall hair. Earrings were often large and heavy when worn with formal garments. Brooches or ornaments, small or large were worn. Heart shapes were common for brooches as well as round sun-like designs of paste or crescents (later in the century). Brooches or rings often had hair incorporated into the design to be a memorial to a loved one who had passed away. Various materials were used during the 18th century. All kinds of gems - semi-precious and precious were used. Diamonds and other precious gems were owned and worn by the wealthy, but the use of pastes (glass stones with added lead to improve the sparkle) became quite common and acceptable. Colored foils were placed behind both gemstones and paste to change the color of the stones so many colors were seen. Gems seen include aquamarine, citrine, ruby, emerald, sapphire, topaz, diamond, agate, chalcedony, carnelian, amethyst, and garnet. Pearl, mother of pearl and coral were also seen. Iron pyrite (Marcasite) was also used to give the illusion of sparkling diamonds. One design staple that was seen during the entire 18th century was the girandole shape. Mostly seen in earrings, this shape was also seen in stomacher brooches and other ornaments. This shape, which is sometimes seen in modern earrings, has three drops that hang at the base of the design. The center drop is sometimes lower and sometimes larger than the others on either side. Martha Gandy Fales book, Jewelry in America 1600 - 1900, shows many examples of this type of earring. Another common earring design in the 18th century was the single drop earring. Many portraits show a single teardrop pearl or gemstone hanging from each ear. An extension of this design was sometimes seen during the 18th century, called a pendeloque. These earrings were long and narrow. Other earring designs were seen, sold, and ordered during this time period, but the girandole and single drop were probably the most common. Other items of jewelry included necklaces, hair ornaments, buckles and rings. Ornaments for the hair made of metal and diamonds or paste were worn that resembled bouncing feathers. 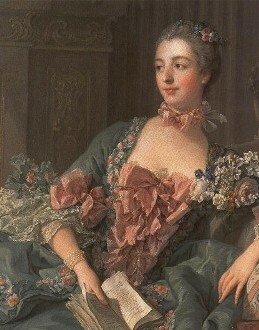 Pearls were often used in the hair and on gowns. Necklaces were often, yet not exclusively, worn closely to the neck and could be of paste, pearls, other gems or ribbon. Buckles were greatly used at the end of this century and the materials ranged from diamonds set in silver to cut steel. Rings were often worn on many different fingers by both men and women. Jewelry of the 18th century was often elegant, beautiful and carefully made. Historic Delights seeks to do just the same - to offer beautiful and carefully hand-crafted pieces to compliment the garments of reenactors or the general public.